The Problem. As I’m sure you are well aware, miners and prospectors have been dealing with federal overreach for decades, which has been exacerbated by a court system that has been ignoring federal mining law and deferring to the very agencies that are abusing our rights to interpret their own rules and regulations. Roads, trails, and access routes have been closed off through the use of Travel Management Plans, Critical Habitat designations, Wild and Scenic designations, Wilderness designations, National Monuments, Areas of Critical Environmental Concern, and more. All public land users have suffered. Miners and prospectors have allowed themselves to be regulated by a permissive system created by local, county, state and federal agencies armed with an agenda to block the extraction of valuable minerals and metals in the name of environmental protection. Non-governmental organizations have successfully vilified miners and prospectors to raise hundreds of millions of dollars. Insects, plants and animals are used to block your every move. But there is a solution. The History. In the mid-1800s, miners did an excellent job of establishing reasonable rules to govern mining. They created order out of chaos. Yes there were some issues like the use of mercury, hydraulic mining and reclamation that needed to be addressed, but for the most part, miners put forth rules and regulations that worked. The miners created small, geographic areas and established rules, and these areas became known as Mining Districts. Mining Districts became federally recognized entities with the passage of the 1872 Mining Act. Mining Districts were established virtually anywhere in the United States where valuable minerals or metals are present. There are literally thousands of Mining Districts in the United States—over 500 exist in California—but many of them are in disarray. There are plenty of additional federal laws on the books that should deter local, county, state and federal agencies from interfering with miners, but agencies and courts continue to ignore them. Joe Martori, a commercial placer miner near Randsburg in southern California, was fed up with the ridiculous rules and regulations placed upon his operation. Joe reached out to Jerry Hobbs, Don Fife and Clark Pearson, three individuals who had extensive knowledge of federal mining laws and experience in dealing with regulatory overreach. Joe also reached out Congressman Paul Cook (R-San Bernardino) for assistance. Following advice from Don Fife and Clark Pearson, Joe tracked down the bylaws for his traditional Mining District—the Rand Mining District. He and fellow miners in the traditional Rand Mining District elected a new Mining District Board and posted signs at major entrypoints to the district. Joe also began attending meetings of the BLM Public Roundtable Committee in Ridgecrest, California. It is an elected board that negotiates rules for several million acres of desert in his area. Joe eventually gained a seat on the board to represent mining interests. The council includes a broad spectrum of interests—the Bureau of Land Management, Forest Service, off-roaders, preservationists, environmentalists, attorneys, and the public at large. Clark Pearson, Joe Martori and I made presentations regarding symbiotic relationships, the 1955 Multiple Surface Use Act, the National Environmental Policy Act, the Federal Land Policy Management Act, the power of Mining Districts, and related topics at the BLM Roundtable Committee meeting in Ridgecrest, California, in March 2016. It was very well received, and many in the group admitted they had little or no knowledge of the laws related to mining and the power granted to Mining Districts by Congress. One of the points I highlighted was how we at the Mining Journal have been instructing our readers to use Direct and Constructive Notice when appropriate. Direct and Constructive Notice is a written notice that is served to a local, county, state or federal agent, advising them of your specific rights as a miner and letting them know that if they continue to violate those rights that you—the miner—will sue them personally. This appeared to get their attention. The Rand Mining District requested a Memorandum of Understanding (MOU) be established with the BLM following this meeting. This MOU has been completed. As a direct result, Areas of Critical Environmental Concern (ACECs) within the Rand Mining District will be removed, and access routes within the Rand Mining District will be reopened for the benefit of all public land users. A subsequent meeting included face-to-face discussions with Jerry Perez, California BLM State Director. Mr. Perez admitted he did not know anything about Mining Districts and the power of Mining Districts. 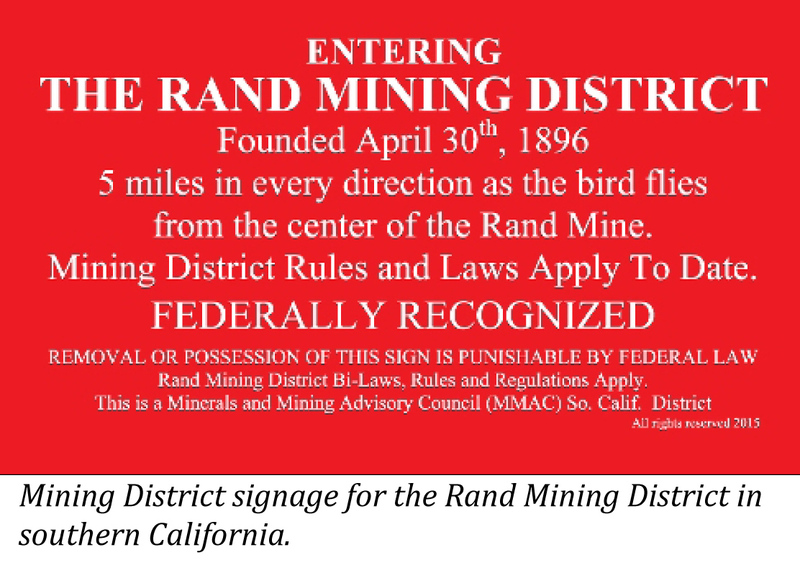 The MOU between the Rand Mining District and BLM is under consideration as a template for all Mining Districts in California. 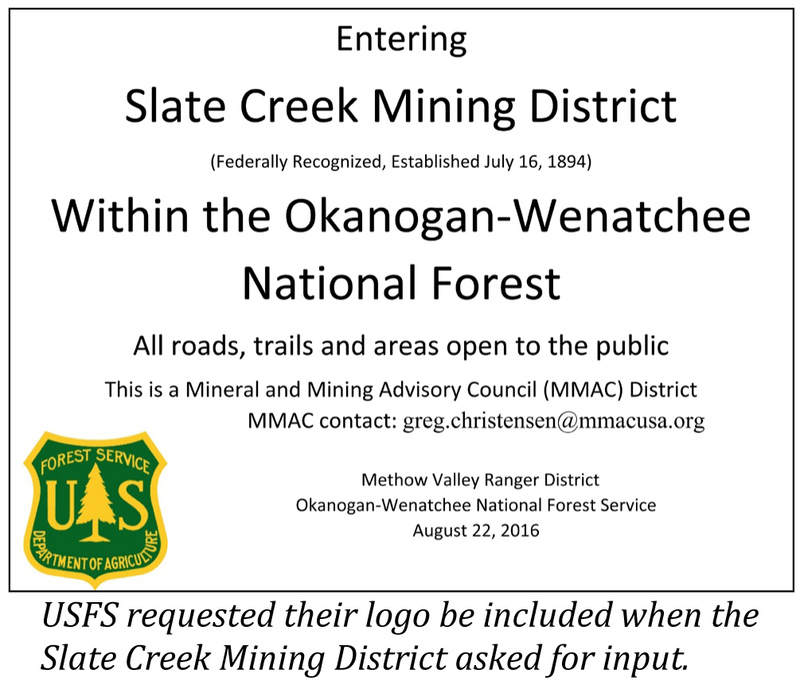 Another recent success story involves the Slate Creek Mining District in Washington State. A proposal was put forth by the federal government to add thousands of acres to an existing wilderness area. After it was pointed out that the Slate Creek Mining District was not consulted, the proposal was modified and new maps were issued that excluded the Slate Creek Mining District from the proposed withdrawal. A representative from an organized Mining District can obtain a seat at the table for steering committees, councils or related oversight groups. A Mining District can also seek coordination status whenever an agency attempts to make changes to land use, permitting or regulations within the district. Imagine having two, three, even ten Mining Districts within a proposed wilderness area, all seeking coordination status. An additional part of the solution involves legislation. Joe and Clark made a trip to Washington, DC, several months ago and had over three-dozen meetings with legislators and committees, including the Armed Services Committee, the House Resources Committee and Chairman Rob Bishop (R-Utah). The end result was another MMAC accomplishment— a request from Congress to come up with a series of bills to address many of the problems related to mining and public land use. Recent News. Nearly 40 Mining Districts are meeting again since we first started publicizing the power of Mining Districts approximately one year ago. Over 50 additional Mining Districts are in the process. MMAC advisors were elected by claimholders in quite a few states. 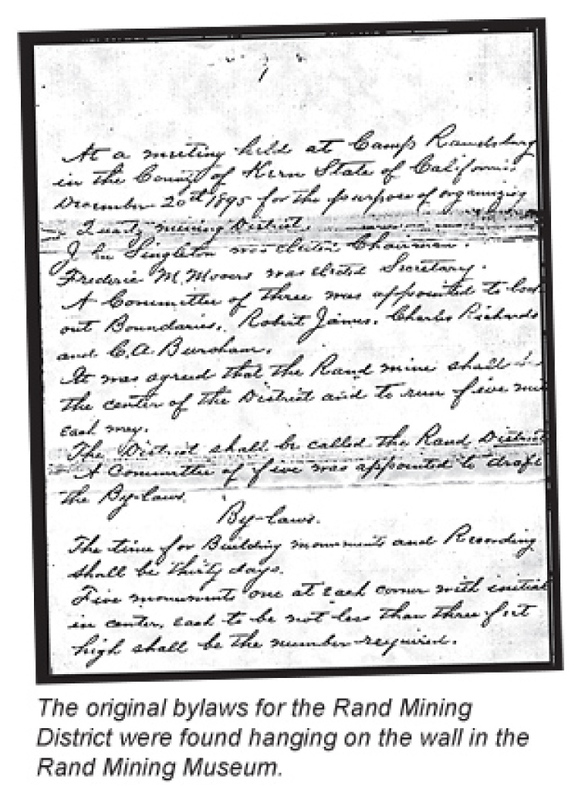 These individuals have volunteered their time to assist miners in locating their original bylaws and help them get their Mining District organized if it is in disarray. Many miners are realizing the potential and stepping in to help. One such MMAC advisor is Kevin Bell, who tracked down the original bylaws for several districts and scheduled meetings for eight of those Mining Districts. We’ve been reaching out to frustrated claimholders for many months. 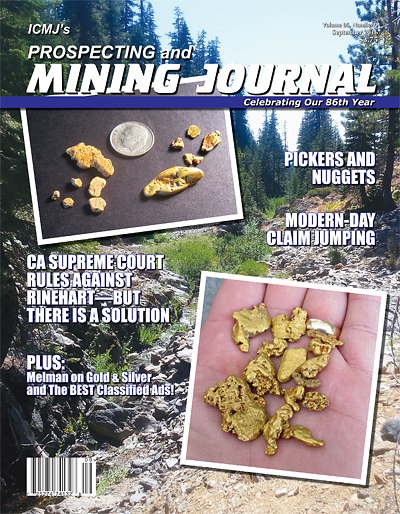 I’ve made presentations at the Motherlode Goldhounds, Shasta Miner’s Association, at our Gold Prospecting and Mining Summit in Placerville, California, and most recently at the Sonora Gold & Outdoor Festival. Joe Martori recently had face-to-face time with BLM’s California State Director to work on an MOU that could be used statewide. Joe and Clark are preparing to head off to Las Vegas for MINExpo 2016 to help educate some of the larger mining concerns and seek financial support for MMAC. 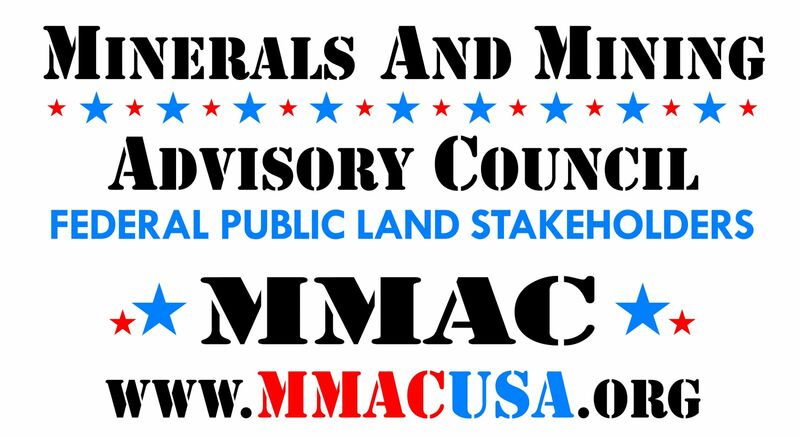 They have also been in contact with Chuck Cushman of the American Land Rights Association, and Chuck has pledged the support of his organization and to get other public land users involved through his vast list of contacts. Joe and Clark are continuing to work on several bills requested by Congress to reopen lands and place mining back at the forefront of creating wealth in the United States. A strong mining industry is a matter of National Security, and members of Congress clearly understand this point. They have also been asked to return to Washington, DC, to assist in this effort, to lobby, and to make more presentations to legislators and their staffs in preparation for voting on the proposed bills and amendments in early 2017. What Can I Do? Be an active part of the solution! That means financially supporting MMAC and getting your Mining District organized if it is in disarray. We have a proven method to reset the playing field. If you are looking for a way to get back in the water with your suction gold dredge; if you want to use motorized equipment in an area where it has been prohibited; if you want relief from excessive state or federal regulations; if you want access to an area that has been blocked off by state or federal agencies; an organized Mining District is the first step. Organize Your District. There are certain steps that must be followed to obtain federal recognition and MMAC will make sure you get there. You must complete your due diligence! b) Try the local museum or historical society. Keep in mind your Mining District may have been in a different county before newer boundaries were drawn. d) Check the "Bylaws for Traditional Mining Districts" page at www.icmj.com under the Resources tab. 5) Determine from the bylaws what you will need in terms of a board. 6) Leave the original bylaws and articles in place. Do not change the borders, names of features, etc. 7) Contact MMAC for a sample template on updating bylaws, which can be done by vote at a future meeting. 8) Contact me at editor@icmj.com for a copy of the notification letter that you’ll need to send to local, county, state and federal agencies that might have jurisdiction in your area. This will insure you are contacted regarding any proposed land-use regulations or restrictions in the works. We’ll go over the above points to make sure everything is covered! 9) Have a Mining District board representative attend any local oversight or steering committee meetings. (Contact MMAC first for training.) Let them know which Mining District you are representing. If they are considering any new regulations or restrictions, ask for a seat on the board to represent your Mining District. If no such proposals are on the agenda, then just let them get used to seeing you at the meetings for a few sessions before you ask for a seat. When the time is right, you might ask if the Mining District has been contacted for coordination status. We can assist with providing materials to help educate them. Yes, it is some work, but I know you will be quite happy when the process is completed and some of the regulatory burden is lifted off your shoulders. Send your support and become a member of MMAC. Put some skin in the game and help MMAC with a $30.00 yearly membership contribution for all MMAC has accomplished and will accomplish. Send to: Minerals and Mining Advisory Council, 2321 E 4th St Ste C-338, Santa Ana, CA, 92705; and (coming soon) you can contribute online and auto pay a monthly $10.00 contribution at www.mmacusa.org for the MMAC Bill, Amendments, MOU, website and constant updates for the Mining Districts. Join MMAC today!